I can’t believe I let January slip through my fingers. It went by incredibly fast and ended without notice. You should’ve seen my face when I found out it was already February; my heart sank. Only because I’ve been meaning to tell you about this fantastic recipe since I returned from Syria back in December; it’s a Middle Eastern stew of sorts called Shakrieh. While I was in Syria, I got to meet Abu Fares. Those who know Abu Fares, or have read his blog, will know why this encounter deserves its own post; this man is a talented writer, inspiring humanist, and simply put, a great person. He really is. Not to mention it is his Shakrieh recipe, which I’ve made four times in the past couple of months, that is outstanding. Abu Fares lives in Tartous, a medium-sized city, quaintly situated along the Mediterranean coast of Syria; roughly a three hour train ride from Aleppo. We agreed to meet for lunch one afternoon while I was abroad. My grandmother and her brother decided to tag along, partly because they love to travel, but primarily because they’re over protective of me, and I love them for that. Plus, I knew my sito would pack delicious treats for the trip in one of her over-sized purses; in her opinion, you can never have too many aaroos (pita wraps with labne and other condiments). I agree. We decided to take a small detour and spend the morning site seeing in Latakia, a scenic beach town less than an hour from Tartous. As I stepped off the train, I immediately took a deep breath, allowing the light briny breeze to fill my lungs. I did this a few more times. It was invigorating. The morning crowds started to fill the streets; mostly women with their children going out to get produce. I noticed a few locals crowded outside this modest shop that sold freshly squeezed orange juice. I got us three glasses as my grandmother pulled a few aaroos from her purse. The weather in Latakia was too cold for swimming, and maybe that’s why the city wasn’t packed with people; the soft sunlight, however, was perfect for taking shots of the shore that morning. We spent the rest of our time leisurely strolling the city: we walked along the boardwalk, visited some historic sites, had coffee at a cozy café, and by noon we were back on our way to Tartous. During the slightly rowdy and bumpy hour-long bus ride from Latakia to Tartous, I rested my head on my sito‘s shoulder and closed my eyes. It’s a gift that I can nap almost anywhere. I eventually woke up to the driver announcing the different stops. We had finally made it to Tartous. Abu Fares and I greeted each other like old friends and I introduced him to my grandmother and her brother. We spent the next hour or so exploring Tartous. 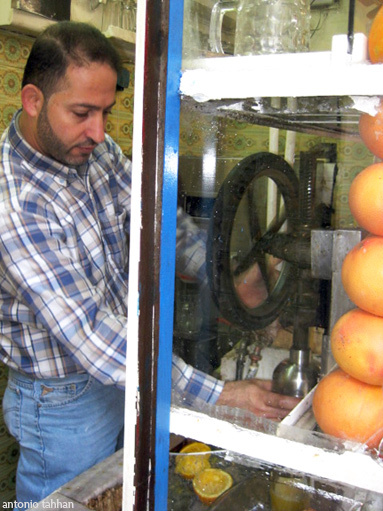 Abu Fares knows this city better than anyone, and many of the locals knew him, too. After the tour we went for some coffee at Abu Fares’ home where we got to meet his family. Abu Fares has a son named Fares, hence his nickname Abu Fares — literally Fares’ Father in Arabic. Fares, like his dad, has his own blog called Superkid Chronicles where he writes about astrology and the different planets; his favorite show, SpongeBob Square Pants; and probably my favorite, the ultimate hot dog pizza. Later that day Abu Fares took us to lunch at this charming restaurant up in the mountains, on the outskirts of Tartous. 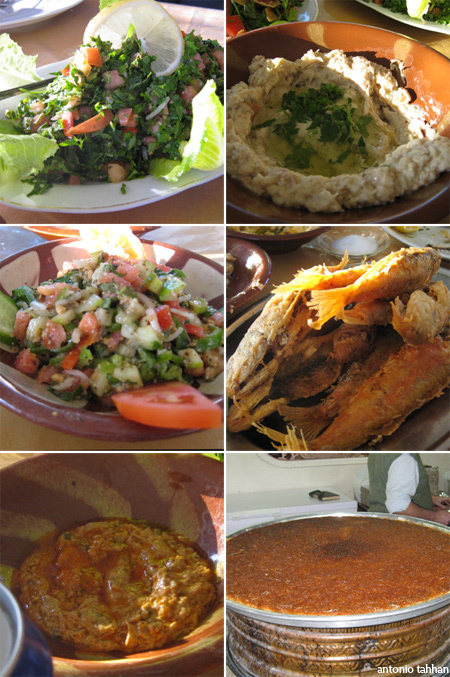 The meal consisted of lots of different mezze, and probably the tastiest freshly-caught fried red mullet (سمك سلطان إبراهيم) I’ve ever had. I posted more photos from my excursion to Latakia and Tartous on my flickr page. What I really need to do is tell you about is this amazing Shakrieh recipe. 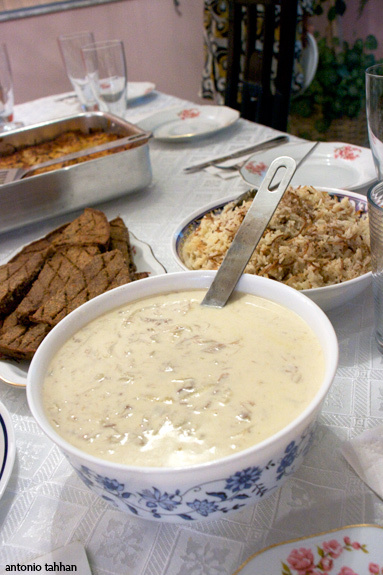 Shakrieh is a traditional dish from Damascus. In fact, very few people knew about it in Aleppo, where my family is from; some knew about it by a different name, which I can’t think of at the moment, while others hadn’t heard of it at all. This dish is pretty fantastic though. If you love slowly cooked meals that make you smile and feel warm inside, you need to try this dish. It’s essentially braised lamb (or beef) that is cooked in a creamy yogurt sauce. Traditionally it’s served with rice or bulger wheat (cracked wheat). Abu Fares’ recipe doesn’t call for these spices, only cinnamon. After a bit of experimenting, I found that the lamb here in the States has a stronger, more pungent, aroma than in Syria. If you’re sensitive to that gamy flavor that lamb is known for, I would suggest adding some of these spices, or even par boiling the lamb before braising it. The other alternative is to use a cut of beef that is suitable for braising, such as beef shanks, instead of the lamb. Shakrieh is symbolic because of it’s pearly, white color; representative of purity, new beginnings and happiness. Abu Fares explains that it has been a tradition in his family to eat this dish on the first day of Ramadan. Going along with the symbolism, I prepared shakrieh for my friends and family for lunch on New Years. Saha wa hana (صحة و هنا) — Bon Appétit. Bring a large pot of water to a boil, roughly 1/2 to 3/4 of the way full. Sweat the sliced onions in a large saute pan with the olive oil (be sure not to brown them) . Then, season the lamb shanks with salt and pepper and add to the onions along with the spices (cinnamon, cloves and allspice) and cook for about 5 minutes. Once the water comes to a boil, add the onions, lamb and spices to the water and lower the heat to medium-low. Braise for a 3-4 hours, until lamb is fork tender. Strain and the broth. In a blender, or with a whisk, mix together the yogurt, cornstarch and raw egg and bring to a simmer over medium heat. Make sure to stir constantly and in one direction* in order to keep the yogurt from separating. Once the yogurt begins to simmer, reduce the heat to low and add the braised lamb chunks, tender onions, plus one cup* of the lamb broth to the yogurt. Cook uncovered for 10-15 minutes and serve alongside rice or bulger wheat. Notes: Recipe adapted from Abu Fares’ blog. Stirring the yogurt in one direction helps keep it from curdling–I don’t know the science behind it, but if you do, please leave a comment; I would love to know. Also, you may need to add more or less lamb broth depending on how thick your yogurt sauce got from the cornstarch. Posted in entrees, Middle Eastern, recipe, savory by Antonio Tahhan on February 6th, 2010. You can follow any responses to this entry through the RSS 2.0 feed. You can leave a response, or trackback from your own site. Wow, I’ve enjoyed reading through your webpage this evening. Lovely photography; with Lebanese non-blood relatives I also share a taste for Mediterranean food, and your recipes make we want to give cooking with it a go. Nice job with everything. Tony, this must have been a huge day for you…no doubt a lasting memory. Many familiar flavours in the lamb shanks dish and I recogonzie deep-fried red mullet in your dishes you had with Abu Fares. It was such a pleasure to spend time with you and an honor to meet your charming grandma and your uncle. Next time in Syria be sure to get in touch with me in order to plan a longer excursion together. Fares is delighted to have you as a friend and he’s been dropping on your blog regularly since your visit. Give your family my best wishes, especially Grandma!!! Love all the spices you ahve used here. In indian cooking these are a must when cooking meat. 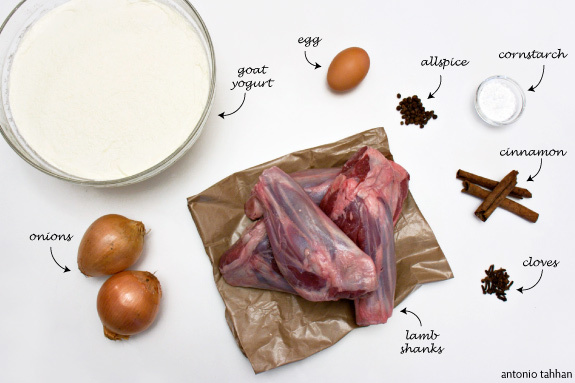 If you find the lamb too strong here, give goat meat a try. it tastes similar (well not exactly same) with milder flavors than lamb. usually available in pakistani/bangaldeshi stops where they sell fresh meat. Thanks for the tips with the yogurt. with so much vegetarian cooking we do yougurt, this is a BIG tip! Tony! I am incredibly jealous! Though I met Abu Fares as well you spent more time with him! Grrr! We really should all meet up together. We need to! Thank you for this wonderful post. I always visit your blog and enjoy your writing after I translate it. I wish I was able to go with you to the restaurant in the mountains. I hope to see you soon my dear friend. Thanks for sharing your pictures. This is really nice. I would love to visit there. I’m so glad you found time to dig yourself out of snowmageddon to post this. I went to Damascus a few times but never had an opportunity to visit the rest of Syria, I’m so jealous of your travels! But I love the photos, thanks so much for sharing them. I never heard of Shakriyeh before, or maybe it’s called a different name. Thanks for sharing the recipe. Abu fares has a very nice blog, I do visit from time to time. This shakrieh reminds me of our laban emmo! Anyway, I like the name! I remembered my first trip to Latakieh and Tartous, I must have been 12! It was great, we also visited an isalnd off the coast, I forgot the name of the island and we stayed at the Baron hotel. i wonder if that hotel is still around! 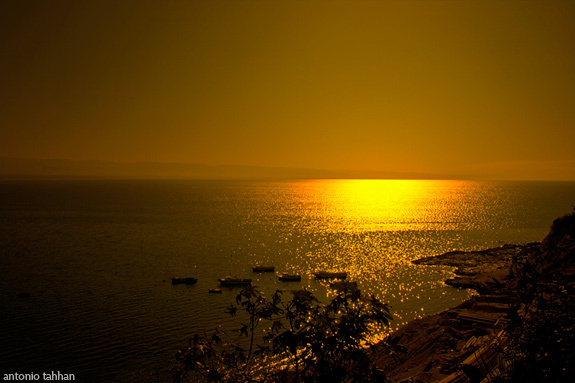 Loooooooooooove shakreyeh! Thanks for posting, does it matter what yogurt to use? When my friends go on about the gamy flavour of lamb, my husband would point out something about using lamb instead of mutton or mutton instead of lamb. You know, something along that line! Hi, Scott! I never knew you had Lebanese relatives! Thanks for the nice comments about my blog — I hope you enjoy the recipes! Peter, the red mullet was definitely one of the highlights of that meal. Fried and with a squirt of lemon; they’re heavenly! Thanks for the comment, Soma! I love learning about similarities between different cuisines. I actually tasted braised goat meat for the first time last year when I visited friends at a goat farm in upstate New York — it was delicious! I look forward to trying the shakrieh recipe with goat meat some time! ya Fares! Kifak? I had lots of fun visiting in Tartous. We all missed you at the restaurant, but at least you didn’t miss out on the knafe for dessert — that was delicious! Take care buddy; I look forward to reading more of your blog posts! Marhaba Arlette! I’m not sure how popular this dish is in Lebanon. My dad’s side of the family in Lebanon had heard about it, but that’s probably because they also have relatives in Damascus. You should give it a try though; it’s similar in concept to kibbeh b’laban, but I found it so much easier since I didn’t have to form the kibbeh! Hi Joumana! I’ve heard of a Baron Hotel in Aleppo, but don’t know of one off the coast of Syria. Is that laban emmo as in his mom’s yogurt? I never heard of it by that name, but that’s really interesting! Thanks for sharing! Hi Nansi! It shouldn’t matter what yogurt you use with terms of the milk, be it cow, goat or sheep. I’ve tried shakrieh with cow yogurt and goat yogurt, and I personally like the slight tang in the goat yogurt for this dish. Sheep yogurt should offer a similar tang as well. In general you just want to make sure that the yogurt you use for the shakrieh is plain whole milk yogurt without any preservatives. I hope this helps! Hi Mrs. Ergül! If someone wants a less gamy flavor, but insists on sheep, I’d say it’s lamb instead of mutton. Lamb is basically baby sheep (less than a year old), so the flavor tends to be less gamy than mutton, which is sheep that is more than a year old. Then again, if someone doesn’t mind the intense flavor of mutton, it would probably be a good choice for a braised dish such as shakrieh. Really great blog post, Tony! Sounds like a good time with friends and food! A wonderful post about your travels and experience. This recipe sounds amazing as well … the spices are so warming and this indeed looks like a comforting flavorful dish. I just stumbled upon your blog googling creme toum recipes. I love it. Keep up the good work. We call it إرمان in Aleppo. I’ve read your blog since day 1. You’ve really helped me with those tricky middle eastern recipes (and being half Syrian and Half British..I need all the help I can get!) I came across this post looking for a Shakrieh recipe—but I’ve got to ask: Is the place that you ate at in Latakia called “Zuzu”? **EDIT: I meant Tartous.. sorry. I do know what I’m talking about. Ahlan w sahlan KeyLimeCat, glad I could be of help 🙂 Unfortunately we didn’t have much time to explore Syria’s coast. We spent half the day in Latakia and the other half in Tartous. Abu Fares took us to a quaint restaurant in the mountains of Tartous, but I cannot recall the name of it. That’s where we had the wonderful fish and the the spread of mezze. I’m in Syria now and would like to make visit Tartous at some point again–I will ask around for this place called “Zuzu.” Is it a restaurant or a fast food place? Hope you’re having a lovely time!! Oh!! I almost forgot! If you’re from Damascus, many people make the commute to Homs to taste “Brosted Kreiche” or just “Kreiche” for short. It’s a fast food restaurant, that really consists of a stand up “ordering counter” (nowhere to sit). You might even sully its reputation by calling it “Syrian KFC”.. except with Shish tawouk, shawermas, and other tasty dishes. Hi KeyLimeCat: I think you’re referring to qashta, or clotted cream, ice cream. It’s a delicious and a popular treat in souk el hamidiyeh in Damascus, although there are places in Aleppo that make it, too. The main reason why that ice cream has a taffy-esque consistency is probably from the addition of mastic gum. 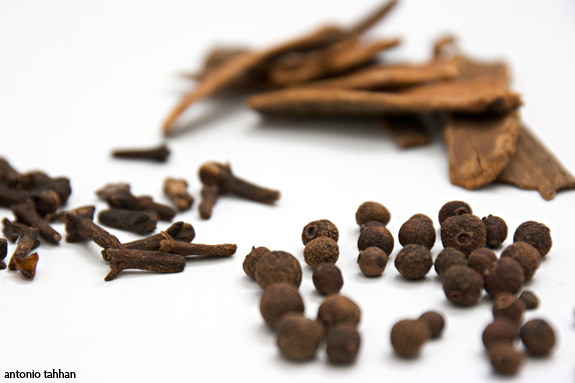 This is a popular spice/ingredient that is used in Greece, Turkey, and across the Middle East (not only in sweet, but savory dishes as well). Also, the fact that the ice cream is made from clotted cream gives it a thicker body than regular ice cream would normally have. I’m living in Aleppo right now, but am only a couple hours away from Homs. I look forward to checking out that fast food place — I might even write a blog post on it. Thanks for the recommendation! I grew up eating Shakriyeh at Christmas time made by my grandmother. My Halabi husband hadn’t heard of it either, but loves it all the same. You have inspired me to try your recipe this week. We swap your spices for dried mint – give that a go next time!